In my discussion of professional etiquette and manners, I noted that social customs pervade the animal kingdom and that you can access an animals intelligence by its response to proper manners. As an animal trainer I use a special field intelligence test for horses. Part of the test is evaluating the horses response to a proper "horse introduction". Just like people, horses have a rigid protocol for introductions and you can always tell a smart horse by their response to a "polite" introduction. Monty Roberts has documented all well-defined horse language he dubbed "The silent language of Equus", and horses do indeed have a complex non-verbal communication system, primarily spoken through posture and motions. When we train horses as guides we must first communicate with them before teaching them the 23 verbal commands (as well as many non-verbal hand signals) that the horse must master to act as a "seeing eye pony". It's important to speak to the horse, as a horse. When greeting a horse, you always approach from the side and stroke their neck. 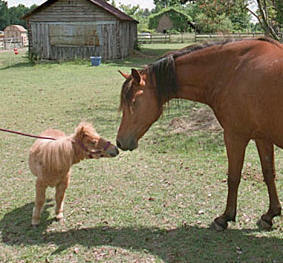 A polite horse will turn to look at you for a formal face-to-face greeting. It is very rude to put your hand-up to the horses nose! Horses have their eyes are on the side of their heads they have a blind spot 12 inches from their nose. Seeing your hand disappear as you reach and then feeling an unseen touch is very disconcerting and impolite. Next, you put your face at the end of the horses nose and blow small puffs of air up their nostrils. The horse will respond in-kind, and the polite horse your turn their ears straight forward toward you. This blowing of air is done is short puffs, about two per second until the scent is acknowledged. This greeting is the human equivalent of exchanging business cards, and is analogous to dogs introducing each other by sniffing. Over millions of years of evolution, animals have developed cultural norms and practices of good manners, and there are hundreds of examples from all mammalian species. In dogs, it is considered very rude to blow air into their face. Some larger breeds will attack you for this rude and unmannerly act. In monkeys, it is considered extremely rude to smile or show them your teeth. In response they may poop in their hand and throw it at you. Dogs find it very rude to take food away from their mouth. In a wild pack, even the most subordinate dogs are allowed to keep whatever food is in their mouths. In stallions it is a huge personal insult to poop-upon the droppings of another stallion. If you can think of some that I've missed, please send me an e-mail at , and I'll be glad to include them on this page.